Students in Grades 6-12 may claim their NCEdCloud IAM Service accounts if instructed to do so by their teachers or school administration. The process is outlined below. 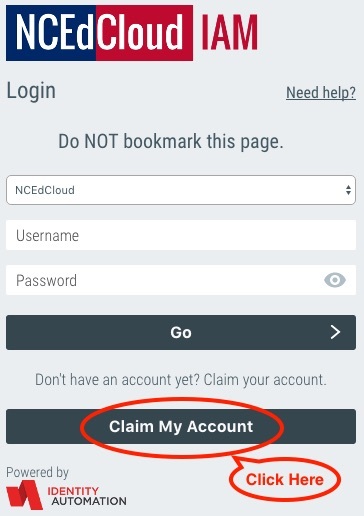 After going to my.ncedcloud.org, students will click on the Claim My Account button at the bottom of the screen (gray NCEdCloud IAM block to the right). 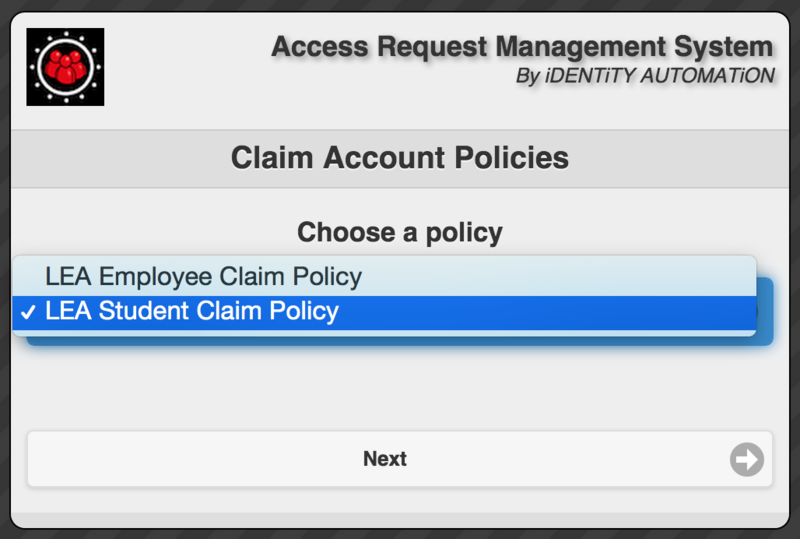 You will then see the Claim Account Policies form with the default setting of LEA Employee Claim Policy. 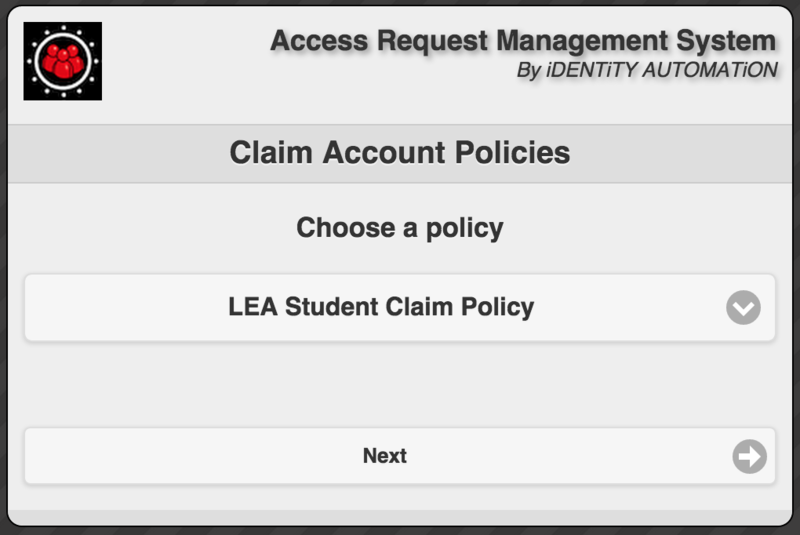 If you are in grades 6-12 and have been instructed to claim your account through this process, you will need to select the LEA Student Claim Policy from the Claim Account Policies screen. 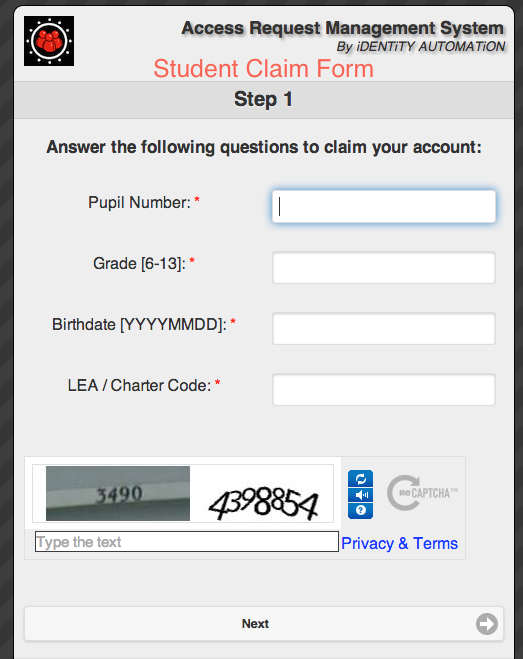 After selecting "Next", the Claim Account process involves three (3) more screens: The Student Claim Form - where you enter some information about yourself; the Set Password screen; and the Challenge-Response Security Questions screen where you answer 5 or more of the questions presented. Before claiming your account you can watch the Claim My Account Video which walks you through the process. Note: Students will enter their their state pupil number, grade, birthdate and LEA/Charter School 3-digit code. For most LEAs, the Pupil Number is the 10-digit number (some students have a shorter number) you have been using to login to PowerSchool (and NCWise before that). When entering your birthdate, the format is YYYYMMDD with no dashes or slashes. Also, you will need your 3-digit LEA Code. Look closely at the Captcha number you need to enter at the bottom and make sure you include any number in the image if present - e.g. "3490" in the example below. NOTE: If at any time the "Next" button doesn't work (remains "grayed out") then the information you entered is either in the wrong format (such birthdate) or may be incorrect in the source system (See Account Claiming Issues for help). It is VERY IMPORTANT you DO NOT BOOKMARK the login page you see when you go to the link (shown in the leftmost image below). If you try to go directly to the Login Page without accessing my.ncedcloud.org or one of the Cloud Applications first, you will get an error message.